The new Samsung DA-E750 speaker dock does two things that other docks don't. First, it plays with both your iOS devices or your Galaxy S. The dock has also been outfitted with a hybrid vacuum tube system that Samsung says will put some audiophile muster behind your tunes. 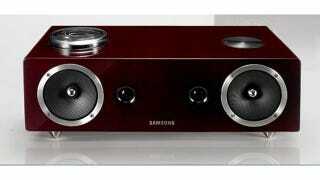 This new shiny 2.1 channel Samsung dock is a rare thing indeed. Docks that support anything besides iOS devices are hard to find but the dual support for iOS devices and Samsung's own Galaxy S line of phones is definitely a first. What's even more surprising is the vacuum tubes—old, analog technology that's only used in specialty audio products these days. Audiophiles like tubes because they produce warmer sound than the solid state audio gear most of us use. Many of them would probably also argue that unless you've got your audio files ripped at high resolution, the vacuum tubes might not make much of a difference.